I know it isn't Monday and well....I'm a tad off schedule this week but we're dealing with that. It is the week before Thanksgiving so of course everyone has about a zillion schedule changes on top of our usual chaos and then add in the second most stressful holiday known to Americans, and you get this. A Monday post on Tuesday.
" The thankful receiver bears a plentiful harvest." I love this quote and also this photo. For me, it really tells and shows the true meaning of being a thankful receiver. This photo makes my heart see how very blessed we all are. How this family, this meal, probably means more to them than we could understand. If we focus on the conditions of this home and the clothes they are wearing, or even just how cramped they look; we probably are thinking..."Oh, how sad." or " Look how poor they are." Those things are probably true. But, I see this. Look how many children they have been blessed with. Look at the clean hair cuts. Do you see the mother and father...together? As a family! Do you see the feast before them? Do you see them looking across the table with mouths full and smiling at their sibling? I can imagine the pride this man has inside for what he has provided his family on this day. He definitely bears a plentiful harvest. True it may only be one meal, one day, but sometimes that is all it takes. To truly be a thankful receiver. I grew up being taught to always be thankful for everything that we had. To some, it may not have been much, or even enough. Sure, there were things we lacked and things we pined for that never came, but we were always thankful for the blessings that we did receive. My Mamaw told us, "We never knew we were poor, because all our neighbors had just as little as us." When she was growing up in the mountains, there was no such thing as convenience. Everything you had, you grew, raised, earned or worked for. Not much was unappreciated or that you weren't grateful to have and receive. If you had extra, you gave it to someone that needed it. You gave and shared and you were thankful when the task was returned. I grew up with these amazing values and ways. We may not have had a fancy meal or money to buy one, but if we had extra food...or even if there wasn't extra, our table was full. We had family, friends, even neighbors to share our blessings with. I think today we get so wrapped up in the "Keeping up with the Joneses' " that we forget what blessings we do have. We lack the ability to be thankful receivers because we have become so engrossed in the next thing we want. The newer, faster, better of everything! As parents especially, we have got to stop this, now! We are raising our children to be UNgrateful. They don't understand what a true blessing is. They can't grasp the concept that it isn't happening or they aren't getting it. They see it on TV, magazines, online, on their phones. Whatever "it" is. They expect it because it is available. And all too often we will sacrifice to get it for them. Just to have "it" forgotten or unwanted in no time! We are wasteful, not thankful receivers. Let's stop this! 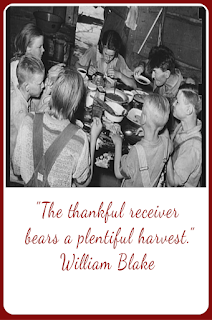 Let's make our children thankful receivers today! 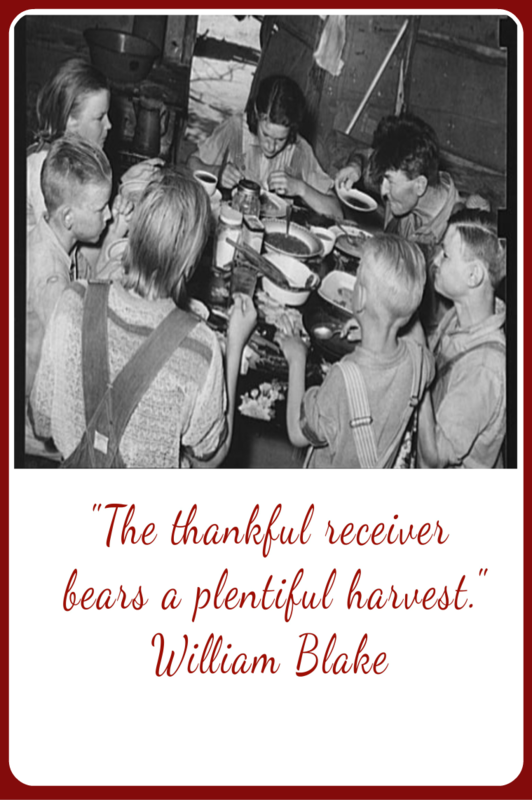 How can you show your children to be a thankful receiver? Please, share your stories. Share your ideas! Let's work together to make a change this Thanksgiving and bear our own plentiful harvest!!! Labels: blessed, momma life, Thanksgiving, What's that quote?